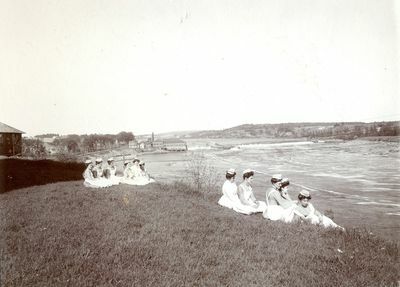 "Bangor, Maine, Nurses Overlooking Penobscot River "
An image scanned from a black and white photograph of nurses in uniform sitting on a grassy bank overlooking the Penobscot River. Bangor Waterworks, the engineer's house, and railroad tracks are visible in the background. Circa 1910.